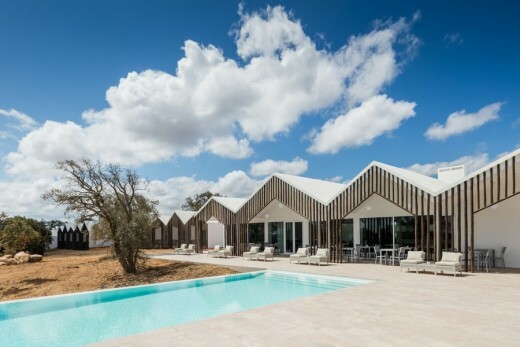 The Sobreiras – Alentejo Country Hotel is located on a property of about 25 ha in the Serra de Grândola, 200 m above sea level, punctuated by cork oak trees holm oaks, olive trees and varied endogenous vegetation. Gentle hills and a vibrant landscape extend to a distant horizon. 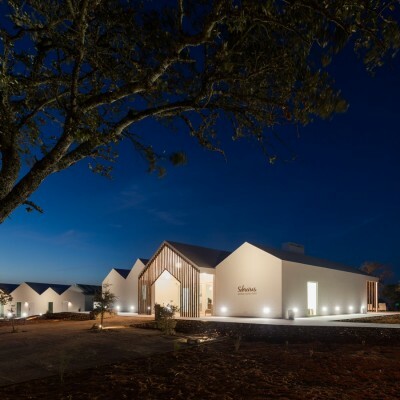 Only an hour from Lisbon and a few minutes from Grândola village, the rural context within which the property belongs greatly favored by the particular beauty of the site, determined the guiding concept – to promote the enjoyment of nature and the discovery of the regional culture. 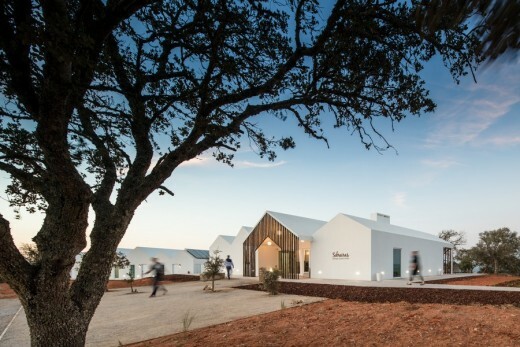 The design is by architect Miguel Correia, along with its multidisciplinary team from FAT – Future Architecture Thinking, with about 30 members between architects, planners, landscape architects and designers. 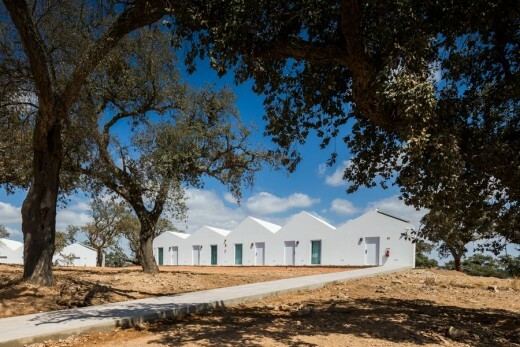 The concern for the preservation and improvement of physical and morphological characteristics of the site, dictated the basic principles of intervention: a simple and elegant design inspired by the surrounding nature with the richness of landscapes and flavors of Alentejo. 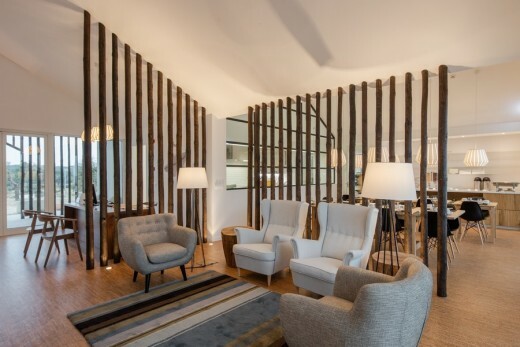 The purpose was to value and favor the rural environment surrounding the hotel, taking it as theme, seeking to provide a space to enjoy the countryside, full of comfort and quiet, in a simple and contemporary atmosphere. 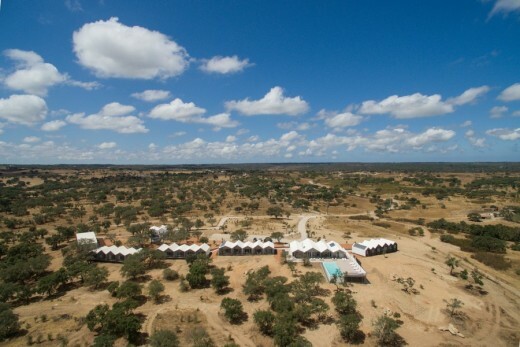 In the hilltop chosen to deploy the hotel, the view extends panoramically facing east. The mountain fauna is revealed in the sounds which inhabit the fields. The constantly changing sky transforms the landscape multiplying its views. Time passes peacefully and slowly. 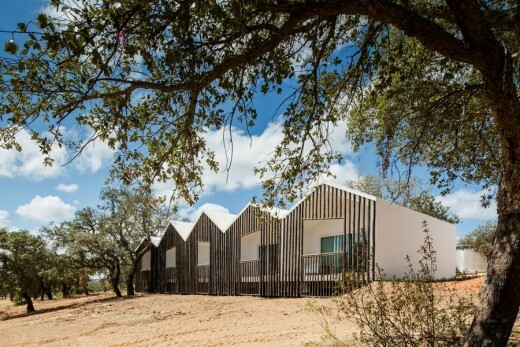 The arrangement of the existing trees on the implantation site led to dividing it into several modules among the trees, preserving and protecting the forest heritage, while taking advantage of this unique nature setting. 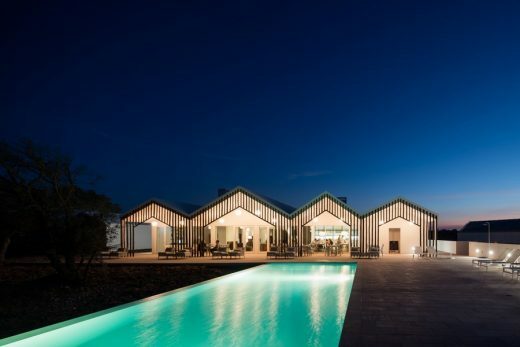 The hotel consists of eight volumes “gently resting” above the ground through a suspended structure that minimizes soil sealing and the extent of the area affected by the foundations. The largest volume contains the entrance and reception and also a set of public and lounge areas. 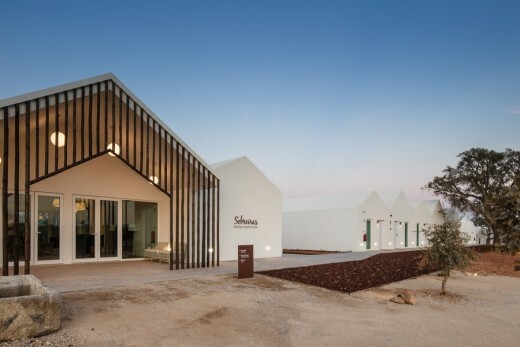 Smaller volumes include staff facilities, technical, storage and service areas. 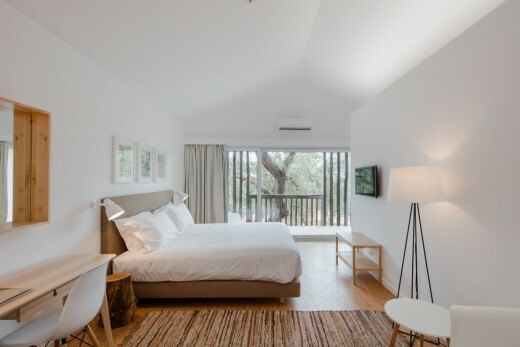 The remaining 5 volumes of approximately equivalent size, features 22 rooms and 2 suites, all with wide spaces, minimal design and private terraces, arranged in sets of 4 or 5 units, providing all the comfort and privacy to enjoy the peaceful countryside. 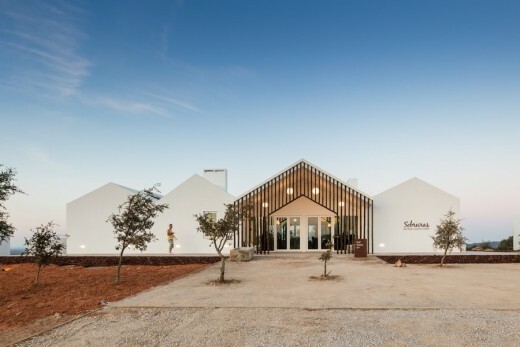 The buildings, formally developed from the combined volumes of evoking the traditional image of a house, seek identification with the characteristics of the traditional regional architecture, in the sobriety of lines and materials. 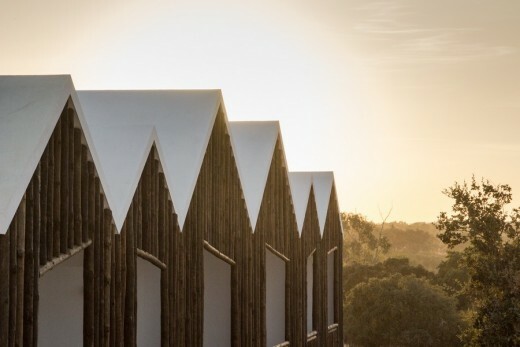 Wooden logs used in facades establish a dialogue with the surrounding landscape, contrasting with these white buildings of simple and refined geometry. 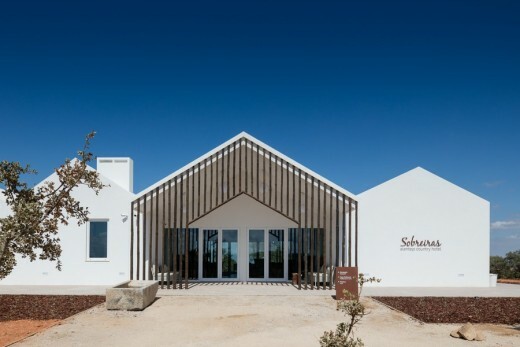 The concern about the buildings thermal stability, essential to the sustainable management of energy resources required to operate the hotel and to the comfort of the facilities, reflects in some of the architectural options taken. Openings are preferably facing east, as in regional traditional architecture, for protection from the strong sun intensity facing west. Wide spans intend to take advantage of the panoramic view, highlighting the landscape exposed as a big picture within each space. To ensure protection of these wide spans during the periods of more aggressive sunlight, terraces and porches were created through extended roofs and vertical wooden logs used for shading. 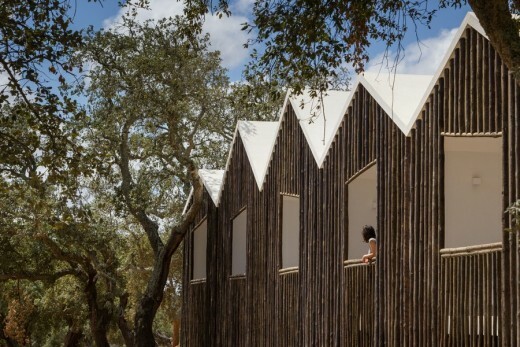 Both exterior and interior walls and roofs were designed and characterized considering the thermal and acoustic insulation needs of the different spaces. 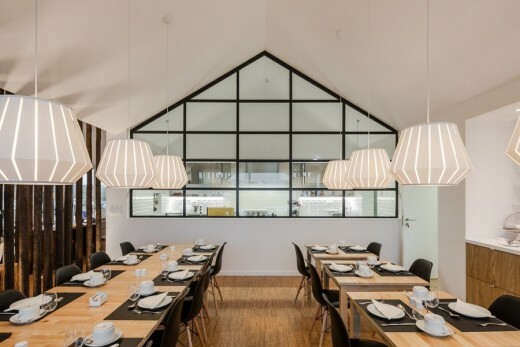 Also the choice of thermal window frames featuring glass with specific characteristics prescribed for the site, address the buildings thermal comfort. Openings in opposite walls, in bedrooms and living rooms, favour natural ventilation. All these measures form an integral part of a passive climate control system, which aims to minimize the need of using complementary active systems. 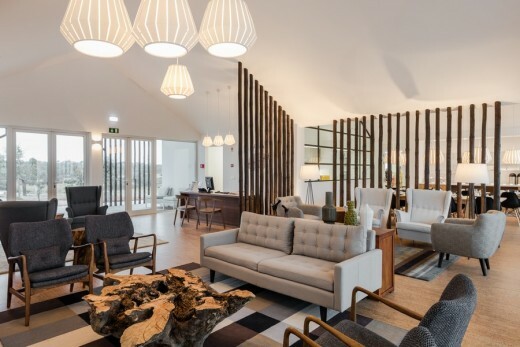 The systems selected to satisfy each of the technical needs of the building, is concerned with respect for the ecosystem and aim to the efficiency and sustainability of the entire set. In order to optimize resources, the building system combines calcium silicate panels and a roof support structure in metal profiles. 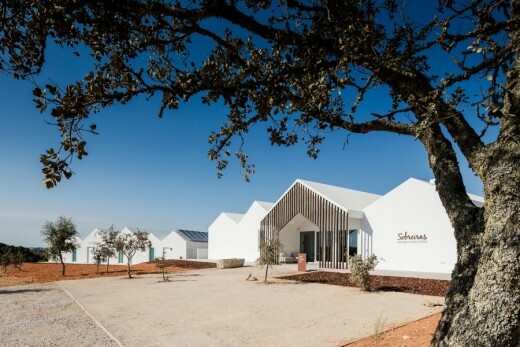 The panels consist of two calcium silicate sheets, which provide rigidity, filled with mortar and EPS, which guarantees lightness and higher thermal and acoustic resistance to the panel, adapting it to the most diverse uses. The choice of this building system considered for greater optimization in construction, reducing the need for hand labour and execution time, allowing the completion of works in just one year. The sustainability of the intervention was evaluated in the local context, considering the environmental impact and the needs of energy resources as well as the technical and economic viability of the infrastructure, with regard to installation, maintenance and operation thereof. Since water is a key resource, the climatic characteristics of a region such as Alentejo impose the demand of its optimal management. As water saving measure, all hotel taps and showers include flow reduction devices, and common areas taps and showers also include timer. A solar thermal system was provided for water heating. The extent of sloping roofs called for rainwater harvest system that allowed its use for irrigation as a means to combat the occasional shortage of this resource. 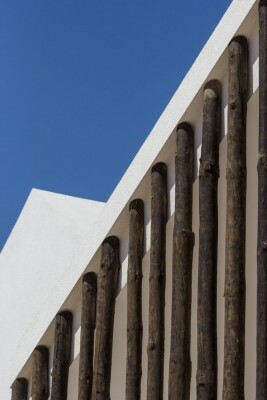 The landscape design intervenes subtly into the territory aiming to preserve and highlight its natural characteristics. 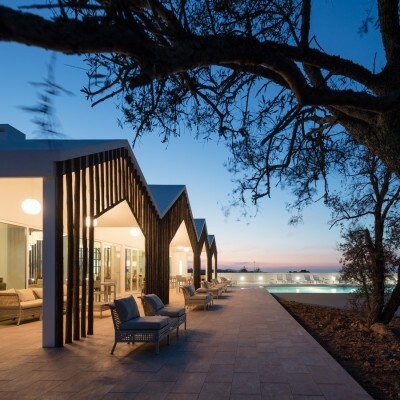 The intervention focuses on west side of the hill, where the access and the buildings stand, leaving intact the east side that forms the natural setting of the Hotel. 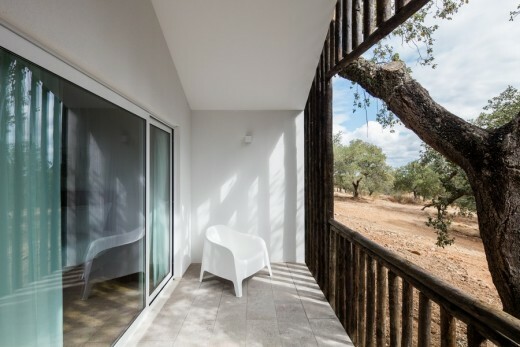 Maintaining the natural dynamic of this site is the cornerstone of this intervention which in exterior space lies in the use of natural and environmentally friendly materials. 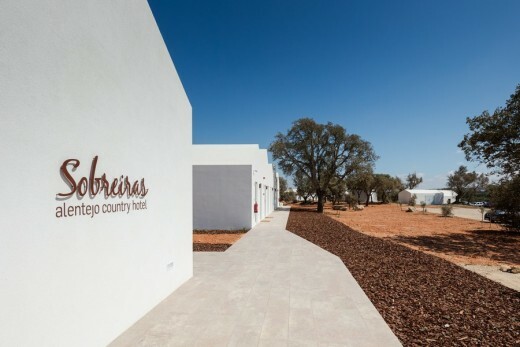 The access path to the Hotel is made of grit for a better landscape integration and to preserve the soil permeability. 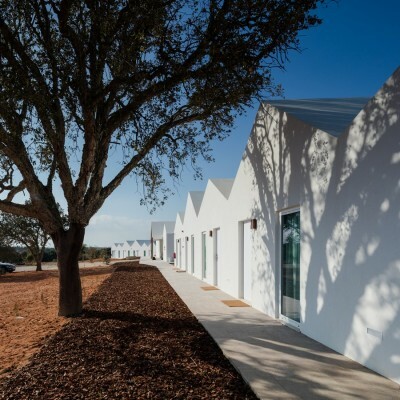 Each building is preceded and framed by a bushy strip, which follows the entire footpath access to rooms, exacerbating the mutability of the landscape through the different expressions which it assumes throughout the year. 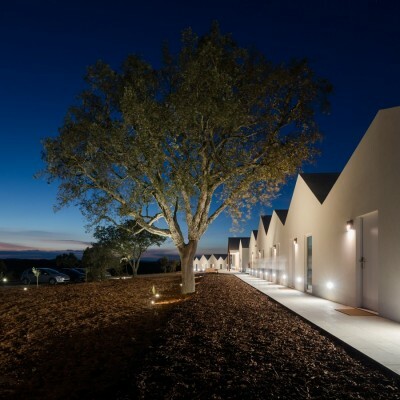 The definition of planted areas has been reduced to the essentials – minimizing the use of irrigation and maintenance – leaving centre stage to the cork oak forest. 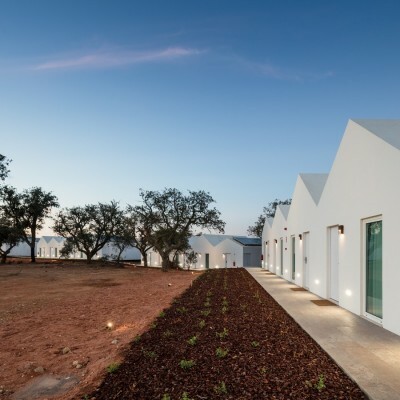 The remaining land preserves the natural characteristics of the Alentejo landscape – the “montado”, the upland meadows and the inherent seasonality – which constitute the very essence of the intervention. 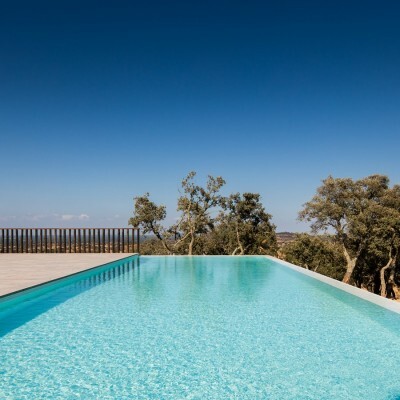 The various outdoor spaces are designed for leisure, taking advantage of the extraordinary beauty of the landscape, and the infinity pool seems to invite to a genuine dip in nature, with the horizon as far as the eye can see.